You can grow poppies from seed, and the best time to plant the seeds is in late autumn to mid winter. Some varieties are very easy to grow in the garden, while others are difficult, and all this depends on the climate. Many are from areas of very cold winters and sharp drainage, others thrive in warmer climates and damp soils. The through away line that ‘poppies are easy to grow’ is true of a few species, others are just difficult. Poppies come in a wide range of colours, all with beautiful flowers both plants and poppy seeds are available for sale in Australia come from a wide range of species. Poppy seeds can be a little tricky to germinate unless you know how to plant them. All poppy seeds are very fine, and all require light to germinate. This means surface sowing. Most varieties will grow best is a soil that does not have lots of fertiliser and manure in it. They do prefer a position in full sun, and you can grow them equally well in the garden or in a container. The best time to plant poppy seeds is in mid autumn to winter, and this is how to do it. Choose the position where you want to pant the seeds. Cultivate the soil well, so that the top layer is fairly fine and even. Sprinkle the seeds on top of the soil. Water in with a very soft spray of water so as not to wash the seeds away, or force then to deep. Keep up with the fine spray waterings until the seeds germinate. You can choose to thin the seedlings out at this stage. From here on water gently, but normally as required. Weed around the seedlings as needed. The two major types of poppies in use in gardens are Meconopsis and Papaver, both species are very attractive with fascinating flowers and many with attractive and decorative seed heads. 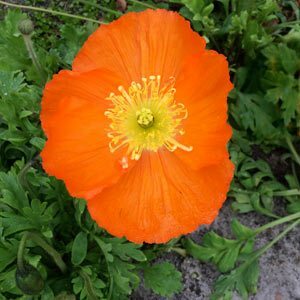 Mecanopsis includes the Himalayan poppy and welsh poppy, while Papaver includes Oriental poppy, Iceland poppy , Opium poppy, Corn poppy and other species. With shades from white from varieties such as ‘Perry’s White’ through to dark red ‘Brilliant. The blue ‘Lingholm’ is a much sought after blue flowered Mecanopsis poppy, however difficult in Australian conditions.